Freedom. Illumination. Pods on your head. 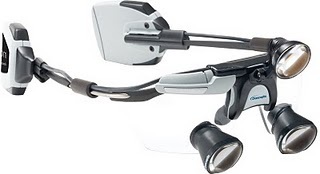 Orascoptic has a new light source for their through-the-lens loupes called Freedom. Apparently the hazards of a corded power source are too much to bear. Thankfully Orascoptic has the solution. Battery Pods on your head! Thats right! Why would anyone want to wear these things? 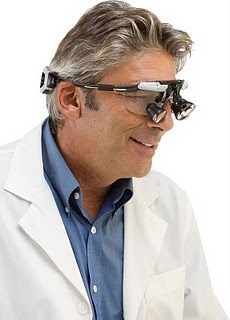 Don’t get me wrong, I am a huge believer in using illumination with your loupes. I just dont want to look like something from Star Wars! About a year and a half ago I got the Discovery light from Orascoptic. The DENTAC commander out here authorized the purchase of a light for each general dentist and most of the EFDAs. Really awesome decision. These lights are amazing. I forgot to charge the batteries this Monday and had to practice for the first time in a year without them. I couldnt see anything. It made me realize just how awesome and important good illumination is. So Im all about lights. But come on, what real benefit does this new light offer? I will confess that I have caught my cord once or twice but it is by no means a daily occurrence. Now the guy wearing them below looks all happy and carefree. Probably because those kayak paddles on his loupes are hidden in his mop of conveniently matching hair. But what if you dont have shaggy hair to hide your battery pods? 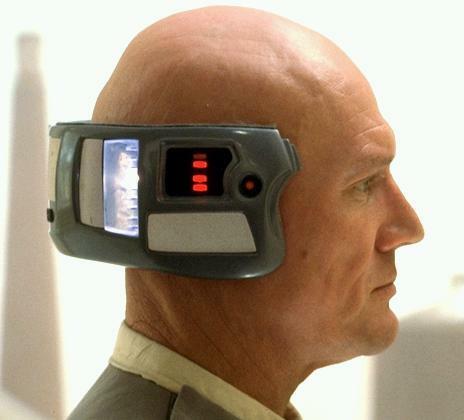 You will probably wind up looking more like Lobot from Star wars than Richard Gere. Oh one other thing. Despite how flat you make batteries, they are still heavy. Apparently these are so heavy they have to have a counterweight on the nose. Sounds comfy. I am very impressed that you knew Lobot’s name. If you get a pair of those loops and wear them, as God as my witness, I will start dressing up like Lando Calrissian.